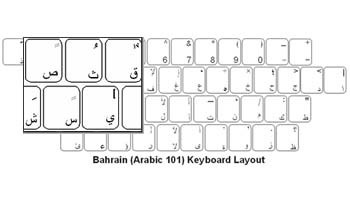 The DataCal Bahrain (Arabic) language keyboard labels are a high-quality, durable and economical solution for creating a Bahrain (Arabic) bilingual keyboard. The Bahrain/Arabic labels support the Arabic keyboard layout in Bahrain, Egypt, Iraq, Jordan, Kuwait, Lebanon,Libya, Oman, Qatar, Saudi Arabia, Syria, U.A.E., and Yemen. The label set includes two sets of number labels so you can elect to use Latin style numbers or Arabic language style numbers. We also have the Arabic (101) and (102) keyboard labels that support other Arabic languages. The DataCal Bahrain/Arabic label set includes both Arabic style and Latin style number labels. You can choose which style you wish to use. Because Arabic text entry is right-to-left, certain characters, such as the parentheses, brackets, braces,etc. are on different keys in different software applications. For example, in Microsoft Word, the left parentheses is on the "9" key. In MicrosoftWordPad, the left parentheses is on the "0" key. The DataCal Bahrain/Arabic keyboard label set includes labels for both configurations.